Mary Poppins, is born Helen Lyndon Goff in Maryborough, Queensland, Australia. her childhood in Queensland, the lengthy negotiations with Walt Disney, and the making of Mary Poppins in 1961.
pulp fiction stories. In the late 1950s, Disney will turn Zorro into a successful TV series. is written by Roy Williams who will go on to appear in TV's Mickey Mouse Club as Roy the Big Mooseketeer. At Disneyland, the Aunt Jemima Pancake House opens in Frontierland. Guests are greeted at the door by Aunt Jemima herself! (Later known as the River Belle Terrace, the Aunt Jemima Pancake House existed until 1962. Actor Eric Bana, the voice of Anchor in the 2003 Finding Nemo, is born in Australia. Imagineer Leota Toombs (also known as Leota Thomas). The attraction will have an official grand opening August 12.
and the release of more than 30 new limited-edition pins. The Lizzie McGuire episode "Just Like Lizzie" debuts on the Disney Channel. It's a moist day for some Disney World guests when a water main on the 12th floor of the Contemporary Resort breaks! The water cascades from the 12th floor down to the 5th floor around 7PM. Hundreds of guests are evacuated and given the option of staying somewhere else. 35th birthday with a special scavenger hunt. Disney Store/El Capitan Theatre at 6840 Hollywood Boulevard. and The Muppets' Wizard of Oz on DVD. "Castle Thunder" - a thunderclap originally recorded for the 1931 film Frankenstein, has been featured in countless movies & TV shows. 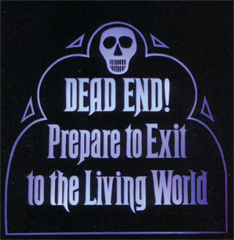 The famous sound effect can also be heard every day at Disneyland and Walt Disney World ... in the Haunted Mansion! Disney-MGM Studios will be known as Disney's Hollywood Studios. 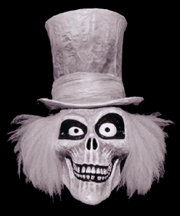 Disneyland's Haunted Mansion turns 38 spooky years young! great outdoors ... but nature is less than co-operative! 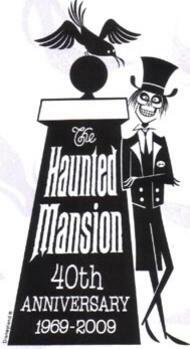 ride through the classic Haunted Mansion! A family from Santa Clarita, California spend the night in Disneyland's Haunted Mansion on the attraction's 40th anniversary! The Sutton family have won a night’s stay inside the classic attraction in a 95.5 KLOS radio station promotion for the Haunted Mansion's 40th anniversary. The family moves in at midnight after the park closes and will stay until 6 a.m.
step all the way in please and make room for everyone. There's no turning back now." "Of course, there’s always my way." Pooh Corner (a live-action/puppet television series that ran between 1983-1986). (a pavilion devoted to health and body related attractions). kicks off in Anaheim, California. animated sequel Cars 2, is released to theaters. since Pooh's Heffalump Movie eight and a half years earlier in 2005.
deep, resonant voice, and Western drawl, he voiced the character of Butch, a Tyrannosaurus who runs a "ranch"
filled with prehistoric longhorns, for Pixar's 2015 animated release The Good Dinosaur. Diaries 2 along with Walt Disney Pictures.